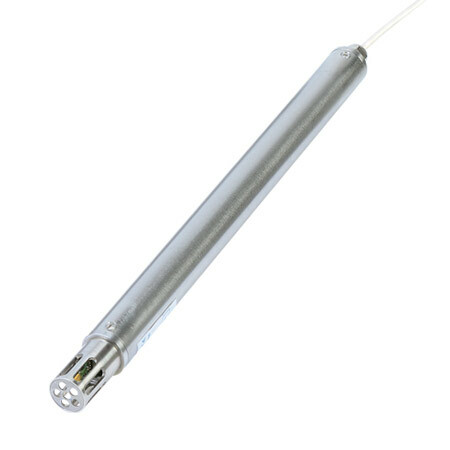 The OMEGA™ HX94B Series temperature/relative humidity transmitter provides a linearized and temperature compensated output signal of 4 to 20 mA, 0 to 1 Vdc, 0 to 5 Vdc or 0 to 10 Vdc depending upon the model selected for both temperature/relative humidity measurement. The output signals have been calibrated and scaled to 0 to 100°C for temperature and 0 to 100% for relative humidity. The digital temperature and relative humidity sensor is protected by a stainless steel cap that is easily removed for cleaning. The NEMA 4 stainless steel enclosure and cable entry connection provides weather tight protection. The stainless steel enclosure terminates to a 6 feet shielded cable. The cable end is either stripped leads or terminates to a 4-pin connector. Note: Comes complete with mating connector (models HX94BC, HX94BV0, HX94BV1, HX94BV2 only), removable stainless steel cap, removable duct flange, wall mounting kit, and quick start manual.